PORT-AU-PRINCE, Haiti, May 31, 2006 -- A proposal by the new United Nations envoy to use foreign judges, including some from Canada, to help run Haiti's corrupt justice system drew harsh criticism yesterday from top government officials, who called the idea an insult to national sovereignty. Edmond Mulet, who arrives Friday to assume control of the UN peacekeeping mission, said over the weekend he would talk with President Rene Preval's government about the possibility of enlisting foreign judges to help reform Haiti's justice system. 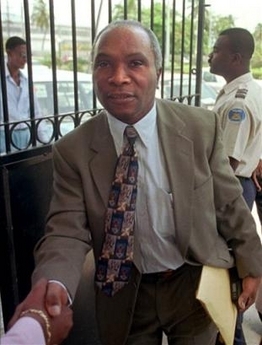 Joseph Lambert, Senate president and a member of Preval's Lespwa party, acknowledged "weaknesses" in Haiti's judicial system but insisted that foreign judges weren't the solution. CAMBRIDGE, MA, May 30, 2006 - Aged 18, yesterday May 29, 2006, the achievements of Gallerie Haitienne, a Boston Haitian-American radio magazine program, have certainly not given its elephantiasis efforts, associated with an exorbitant economic cost, to inform, to educate Haitian expatriates and Haitian-Americans, the very image of futility. There are numerous reasons for so. Mention Gallerie Haitienne to the vast majority of Haitian expatriates and Haitian-Americans residing in the state of Massachusetts, including parts of the contiguous states of New Hampshire and Rhode Island, who often say to have suffered from nostalgia when referring to their native nation of Haiti, most of the time the argument is: one thing is for sure we can boast to have been well informed about political events and many others in our Caribbean nation of birth. A series of educational shows dealing with immigration issues, in addition to health care, have, too, been the decisive factors for making a good case that Gallerie Haitienne is a serious one, and the host, Mr. Delva Pierre Toussaint and collaborators, including Mr. Eugene Duperval, deserve praise for their immeasurably efforts, which many are convinced will continue to enjoy success, and for many more years so. A final compliment and wish - so may we, at wehaitians.com, say that Gallerie Haitienne 18 years of success is nothing more than a prelude to professional radio journalism that it will further shape, and extremely so, in the near future. He is dammed; he is stupid; he is extremely inarticulate; he is a failed neighborhood baker. What's more? He is a terrorist, as the bomb, among many other horrific acts, Rene Preval detonated, in late 1990, in the Port-au-Prince suburb of Petion-Ville during a public political event suggests. Still, extreme violence-issued de facto Haitian President Preval always claims to possess a college degree in agronomy from the University of Leuvens, in Belgium, conferring him the right to say over and over that he is an agronomist. But according to wehaitians.com investigation, yes he did attend the prestigious institution of higher learning but was forced to withdraw during his freshman year after most of the grades assigned to him were F.
Now it is up to Preval to forward wehaitians.com, which e-mail is letters@wehaitians.com, a copy of his college degree and transcripts for publication to prove that the Leuvens University's senior official it spoke to, on the condition of anonymity, Thursday, by way of a telephone, has erred..
MAY 24, 2006 - The head of Haiti's financial crimes investigative unit, who has been probing money laundering and corruption in ousted President Jean-Bertrand Aristide's government has been arrested. Investigative Judge Jean Peres Paul issued an arrest warrant and Jean-Yves Nol was picked up at 4:45 p.m. Monday in his office in Port-au-Prince. He is being held at the city's penitentiary. Peres told The Miami Herald that he issued the warrant for Nol's arrest because he failed to show up for a May 3 hearing. Peres launched an investigation of Nol in November after a court processor accused Nol of ordering his bodyguards -- Haitian National Police officers -- to hold him captive in his car for about an hour outside of the Banque Populaire Haitienne in Port-au-Prince. Nol was attempting to prevent the processor from serving a court summons that would have released more than $6 million belonging to the Aristide Foundation, according to sources familiar with the case. The funds had been frozen at Nol's request, as part of his probe. Peres said his decision to arrest Nol has nothing to do with the corruption investigation. Nol's attorney, Carol Chalmers said the arrest was politically motivated. Nol's unit has issued two blistering reports accusing Aristide and his supporters in Haiti of corruption. CAMBRIDGE, MA, May 20, 2006 - Every Haitian, just about, has heard of Jacques Eduard Alexis, 58. Extremely terrorist minded and notorious murderer, allegedly in the name of the Republic of Haiti, the poorest nation in the Americas. That is how Haitians and non-Haitians, too, referring to the August 20, 1996 broad daylight unlawful execution of opposition members, the Rev. Antoine Leroy and civil engineer Jacques Florival (they were forced to kneel down), after they were dragged from their homes - the latter victim, in front of his very young daughter, approximately 6 year-old - when Alexis was a totalitarian prime minister (1996-2000) as sadistic and largely inarticulate so-called President or office boy for former ferocious tyrant Aristide Rene Preval was, too, murdering his own assumed political opponents and governing by decree after dissolving parliament ambivalently characterize Alexis who should long - like Saddam Hussein, the late Slobodan Milosevic - be brought to the dock for an immeasurably number of other horrors as well. Unfortunately, for extreme violence-issued de facto President type-A Preval, stridently anti-United States, as his many voyages to gerontocrat genocidal tyrant Fidel Castro's Cuba suggest, the idea of exterminating, even said political opponents, will not alter during his tenure, but this time, as grossly incompetent declared president. The more you are capable of murdering democracy advocates, the more likely you are to join Preval's - he is a former failed neighborhood baker - illegitimate government, as the nomination of Alexis (he is also stridently anti-United States) this week, who just a few weeks ago was barred from Canada for gross human rights violations related activities, for the position of prime minister suggests. PORT-AU-PRINCE, Haiti, May 19 (UPI) -- A Haitian gang took a Brazilian colonel hostage but released him after two hours, O Globo reported Friday. The colonel -- who only gave his last name, Odair -- was taken hostage Thursday by armed gunmen who threatened to kill him if their leader, known as Commander Evans, was not freed in return. It is not known whether Evans was released or was ever in the custody of U.N. peacekeepers. Brazilian forces lead the 2-year mission in Haiti that arrived on the Caribbean island shortly after the departure of former President Jean-Bertrand Aristide, who left the country in February 2004 under pressure from armed rebel groups. Many of the country's armed gunmen remain loyal Aristide supporters. Earlier this year, Haitians went to the polls and elected a new president, Rene Preval, who assumed office this month.